LOS ANGELES — Bernie Sanders said Tuesday he was “really disappointed” and “upset” that The Associated Press declared rival Hillary Clinton the presumptive Democratic nominee on the eve of primary elections in six states, adding a somewhat muted voice to the outrage expressed by many of his supporters. In an interview with NBC News, Sanders expressed concern that the news of Clinton’s victory came the night before “the largest primary” and that it was based on what he described as “anonymous” commitments from superdelegates — the party insiders and Democratic officials who can vote for the candidate of their choice at the summer convention. The AP’s delegate count is based on pledged delegates won in primaries and caucuses, as well as a survey of superdelegates. The AP only included superdelegates in its tally if they said they would unequivocally vote for Clinton or Sanders at the convention. According to the AP’s count, Clinton secured the commitments of enough delegates to become the presumptive nominee on Monday night, the day before primary elections in California, New Jersey and four other states. 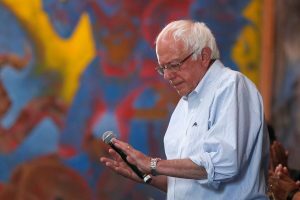 Asked if he believed the news might suppress the vote, Sanders demurred, repeating that he was disappointed in the decision. Sanders’ tone didn’t match the anger expressed by some of his supporters, who vehemently protested the decision of the AP and several television networks to report on Clinton’s delegate count Monday night. “When the mainstream media calls the polls, calls the election, because they’re already planning to do it to suppress the vote in California, we will fight on,” Nina Turner, a former Ohio state senator and one of Sanders’ top surrogates, said at a Monday night campaign rally. “It’s ridiculous. California is the biggest state in the nation,” she said. On Tuesday, that frustration was evident on social media, as angry Sanders’ supporters accused the AP and the television networks of stifling voter turnout and relying upon superdelegates who won’t formally cast their vote until the party’s Philadelphia convention in July. Clinton now has the support of 1,812 pledged delegates won in primaries and caucuses, and the support of 571 superdelegates — adding up to the 2,383 needed to become the presumptive nominee. In the AP’s survey, which began in late 2015, no superdelegate has flipped support from Clinton to Sanders. None has suggested that could happen.